These two images appeared in a 1931 edition ofThe Chronicle. The first image (group picture) appeared in the September 1931 edition of The Chronicle. It was among two other pictures that were neither related to each other nor directly connected to any article. 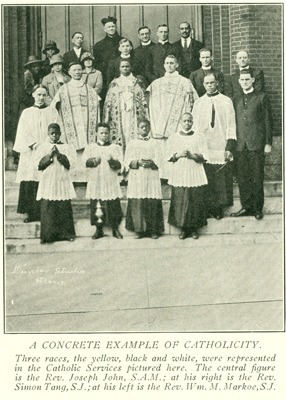 Note that Father William Markoe, a significant and somewhat controversial figure in the FCC, is among the priests pictured. 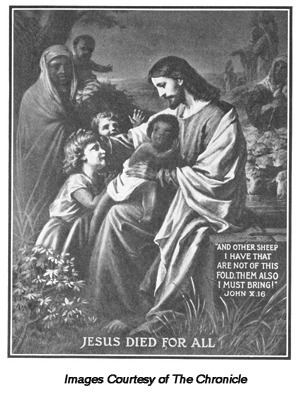 The second image, entitled Jesus Died For All, appears as the frontispiece of the September 1931 edition of The Chronicle. This edition opened with a welcome to FCC members attending the seventh annual convention in St. Louis and contained articles on the workings, platform, and convention program of the FCC. This image also appeared on the letterhead of The Catholic Board For Mission Work Among The Colored People (Document 6). Reconsider the definition of the term catholic. Do you think "A Concrete Example of Catholicity," was an appropriate subtitle for this picture? Explain your opinion. What do you think the illustration entitled "Jesus Died For All" intended to convey to the reader? What are the similarities between these two images? Explain how you think these images reflect the mission and actions of the FCC and the National Catholic Federation for the Promotion of Better Race Relations which were discussed in the above documents.